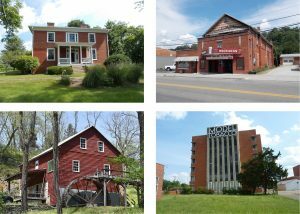 Among 13 places approved for listing on the Virginia Landmarks Register by the Department of Historic Resources are districts in Roanoke and James City County that highlight the economic impact of railroads in the late 1800s, a municipal electric power plant and waterworks in Culpeper, a mill from the 1700s in the northern Shenandoah Valley, and a 101-year old theater in Botetourt County. The Chesapeake & Ohio Railroad’s extension across Virginia’s Lower Peninsula to Hampton Roads spurred development of the Toano Commercial Historic District after the railroad reached Toano in 1881. The C&O boosted prosperity in James City County and Toano by the movement of goods and people through the region and by providing greater access to northern cities, soon engendering a new market-oriented economy in the county, one centered on truck farming. Shipment of products to urban markets also gave rise to new manufacturing operations in Toano with the construction of a barrel factory and a cannery. Around 1903, the town saw the construction of a group of commercial buildings including a bank. In 1906, to further propel growth, the the town relocated its depot and original rail line, which had cut through the town center, impeding development on its eastern and southern margins. That action effectively opened the town for redevelopment and the construction of new buildings. During the early 20th century, the advent of motor vehicles brought new commercial opportunities to Toano when in 1926 Richmond Road, stretching along the district’s southern margin, was paved and merged into a new system of national highways, and designated US 60. Roadside inns, restaurants, and gasoline stations appeared along the road, although many were later demolished when US 60 was widened in 1966. Today’s district hosts an array of buildings constructed between 1903 and 1930 in a vernacular Commercial Style. The Roanoke neighborhood encompassing the Belmont Historic District developed in the late-19th and early-20th centuries by providing housing for the inflow of workers filling positions at the Norfolk & Western Railway’s operations, begun in the city in 1881. The earliest speculative housing development in southeast Roanoke, Belmont started in 1888 when the recently-formed Belmont Land Company purchased rural acreage along the N&W line’s south side. Subdivisions arose, with street car lines reaching Belmont by 1905. The earliest houses, mostly those closest to the railroad, tended to be of Folk-Victorian vernacular design and two-story frame construction. The district includes some larger Queen Anne and Colonial Revival-style houses built for managers and business owners, but as the neighborhood grew the majority of residential architecture continued to be modest housing with limited detailing. In 1917, a new industry further fueled growth in Southeast Roanoke, when the American Viscose Corporation established a plant nearby along the Roanoke River. American Viscose gave rise to houses on scattered vacant lots in Belmont nearer to the N&W line or concentrated in the less-developed southern section, further from the railroad. American Foursquare is the dominant form of these later houses with detailing in either the Colonial Revival, Craftsman or Prairie styles. As it filled in during the 1950s, other housing forms – Cape Cod, Ranch, and Minimal Traditional – were built in lots scattered throughout Belmont. Consisting of two buildings, the Culpeper Municipal Electric Plant and Waterworks is associated with trends in municipal electric generation and distribution, and improved treatment of drinking water in rural America during the 20th century. Completed in 1934 to replace an older power plant, Culpeper’s Municipal Electric Plant was the first such facility funded with federal Public Works Administration (PWA) financing as part of President Franklin D. Roosevelt’s administration’s emphasis on rural electrification. Culpeper’s plant proved to be an economical and efficient source of electric service. Within its first five years the new plant reduced consumer rates by approximately 10 percent and profited the Town. That success prompted other Virginia municipalities and utility companies to evaluate their rate structures and improve their services. With upgrades over the years, the Culpeper Municipal Electric Plant remained in operation until a new facility on a different site replaced it in 2006. Culpeper’s Waterworks, completed in 1947, incorporated technological advances in water treatment, and adhered closely to revised and expanded water treatment standards issued by the U.S. Public Health Service in 1946. Those standards regulated the bacteriological quality of drinking water and introduced methods for removing disease causing substances and pathogens. Both the electric plant and waterworks buildings exemplify the era’s Moderne style, as shaped by federal involvement. The PWA’s stringent oversight and regulatory standards for design, engineering, and construction are evident in the Electric Plant. The Culpeper Waterworks building continued a federally standardized Moderne style into post-World War II. The red brick facing of both structures matches building materials used historically throughout Culpeper and visually softens the industrial nature of the complex within its surrounding residential neighborhood. In the Shenandoah Valley, Locke’s Mill is a legacy of Clarke County’s rural milling industry, which survived during the Civil War and the subsequent collapse of the South’s slave-based economy. The milling industry from 1870 to 1930 constituted the bulk of Clarke’s economic activity. Locke’s Mill used an advanced system of “continuous milling,” a system employed in the county. Developed by 18th-century inventor Oliver Evans, continuous milling relied on elevators, pulleys, and augers to move grain and flour through the mill. The Oliver Evans system eliminated the manual labor required to haul sacks through a mill and enhanced production, radically transforming America’s milling industry. The original Locke’s Mill was likely adapted to the Evans system in the late 1700s. In 1876, Joseph Price rebuilt the mill re-incorporating the Evans system, and the mill remained active until 1936, when flooding heavily damaged it and production ceased. In 1992 the mill was restored, largely reviving Price’s work, although only pieces of the Evans system remain. Today Locke’s Mill mostly serves local distilleries for custom milling work, maintaining a two-and-a-half century tradition of local milling. Since its construction around 1917, the Buchanan Theatre has served as a principal entertainment venue and social hub in the Botetourt County town of Buchanan. Originally known as the Star Theatre, the two-story gable-fronted building was built and operated by the Shank family. Jack and Homer Jackson purchased the building in 1946 and, in 1949, remodeled it in the Moderne style, adding a new brick facade, neon marquee, ticket booth, and restaurant wing. The interior, with its knotty-pine lobby, streamlined concession stand, and Art Deco seating dates to the remodeling and a subsequent, less extensive remodeling in the 1950s. During the 1950s and 1960s the theater occasionally hosted live acts including bluegrass entertainers such as the popular duo Donald Wesley Reno (1926-84) and Arthur Lee “Red” Smiley (1925-72). In 1999, new owners undertook renovations to the theater, and in 2001 a nonprofit formed to manage the venue. Having won a number of awards and hosted film festivals, the Buchanan Theatre remains a vibrant and contributing presence in the Buchanan Historic District, listed on the National Register in 1999. Arrowhead, located on north side of the James River in Nelson County, is important as the one-time residence of Colonel Wirt Robinson (1864-1929), a descendant of Dr. William Cabell (1699-1774), who received a 1738 land patent on 4,800 acres in present-day Nelson and Buckingham counties and the future site of Arrowhead. The legacy of Col. Robinson, a professor at the United States Military Academy, rests on creation of the first military science program at then-Harvard College, extensive publications in many areas of science and natural history, and specimen bird collections still used today for research at the National Museum of Natural History in Washington D.C. Robinson kept meticulous diaries and records of his natural history pursuits and the Indian artifacts he collected. His collection consists of approximately 24,000 stone artifacts, all of which the National Park Service purchased from his estate in 1938. Arrowhead’s primary dwelling, a one-and-one-half story brick residence of highly customized design and construction, was built for Robinson in the early 1920s. The house has a side-gable roof clad with slate shingles from historic quarries in Buckingham County. In Newport News, the Basic Construction Company Headquarters Building housed one of the hundred largest construction companies in the United States for almost 70 years. Originally known as Virginia Engineering Company, Basic Construction Co. became one of the leading builders for the U.S. Army and Navy during World War I and World War II, and for decades after. It also was chosen to complete hundreds of municipal, state, federal, and commercial projects valued at tens of millions of dollars every year. Founded by the Noland family in Newport News, where it remained under two generations of family management, the company built its multi-story, Colonial Revival headquarters building with Flemish bond brick siding in 1945, and in 1965 expanded the headquarters with a three-and-half story late International Style addition. The company continued its operations at the site until 1982, when it ended its general contracting business. The Cavalier Shores Historic District in Virginia Beach began in 1927 as a housing development sponsored by the city’s now-iconic Cavalier Hotel, which opened that same year. While the neighborhood’s direct link to the hotel has since faded, a brick promenade leading to a gate to the hotel grounds recalls the earlier connection. Cavalier Shores is an example of coastal suburban development during the first half of the 20th century. Its dense housing dating to the era indicates the neighborhood’s early popularity and subsequent growth. Its seven blocks of houses are predominated by Colonial Revival style designs, with Tudor Revival and Minimal Traditional. Lining the neighborhood’s alleyways are a complement of rear garages and guesthouses, the latter a common feature of coastal developments of the era. The district also conveys a sense of beautification and landscaping, a defining aspect of the neighborhood since the 1920s. Most of the district’s lots were developed by the late 1960s. Today, Cavalier Shores is a rare collection of early-20th century residential architecture in Virginia Beach. Fort Lewis is a scenic Bath County property with a history reaching back to colonial times. Established on the Cowpasture River by the Lewis family in the 1740s, the property was the site of a frontier fort during the Seven Years’ War (French and Indian War). The fort is gone, but the antebellum Fort Lewis house survives, a two-story brick residence detailed in the Greek Revival style. Near the house stand a large timber-frame corncrib and other farm buildings, and near the river is a timber-frame gristmill that doubled as a polling place in the late 1800s. The mill has been repurposed as a restaurant serving the modern resort, Fort Lewis Lodge, which added the lodge and guest cabins to the property. A remnant of a log crib dam in the river, the ruins of a stone lime kiln or kilns in a mountain hollow, and a tenant house are other historic resources on the 1,800-acre property. Collectively, the quality and diversity of Fort Lewis’s architectural assemblage ranges from high-style antebellum domestic architecture to 19th- and 20th-century agricultural and industrial construction. The earliest likely date of construction for the surviving historic resources is around 1840. Constructed in 1930, the General Outdoor Advertising Company Richmond Branch building reflects the rapid growth of the outdoor advertising industry in Richmond and nationwide during the second quarter of the 20th century. General Outdoor Advertising Company (GOA) formed in 1925 in Chicago through the merger of two competing companies, and it quickly established a network of satellite branches to facilitate regional advertising campaigns. GOA opened its Richmond operation in 1926 in the city’s south side. It built a new Richmond branch building just four years later on the same site, erecting a fashionable Art Deco-style structure that fronted US 1. Dedicated to the marketing, construction, and installation of highway billboards, GOA’s Richmond operations lasted through three decades under one of the largest and most prominent outdoor advertising companies in the nation. In 1962, another nationally known business, Turner Advertising Company (Turner Enterprises), acquired Richmond’s GOA branch, and also used it as an advertising office and production site. Milburne is a handsome two-and-a-half-story Georgian Revival mansion, built in 1934-35. The Windsor Farms estate on which it stands has a storied presence in the history of Richmond and Virginia and an equally distinguished history when it comes to Colonial Revival architecture. Milburne is nationally significant as it embodies the collaborative creative efforts of celebrated architect William Lawrence Bottomley, his clients, the couple Mary Dade Taylor and Walter Spencer Robertson, as well as the oversight of scholar-builder Herbert Augustine Claiborne, and a quartet of eminent American landscape architects, beginning with Charles Freeman Gillette. Milburne’s impressive integrity and survival as a landmark of the American interwar period reflects the fortunes of its ownership by Walter and Mary Taylor Robertson, the latter of whom resided at Milburne from 1935 until her death in 2001 at the age of 101, and next by William Johnston Armfield IV (1934-2016) and Jane Alston Hall Armfield, a granddaughter of Claiborne. Milburne also is important for its association with the life and career of Walter Spencer Robertson (1893-1970). His postings in the U. S. Department of State in 1943 to 1946, followed in 1953 to 1959 by service as Assistant Secretary of State for Far Eastern Affairs, elevated his status in public life among that of his generation of Virginians. The Model Tobacco Company complex in Richmond, with its factory building, power plant, and tobacco warehouses adjacent to the railroad and a major roadway, is an example of a horizontally arranged tobacco production facility. As such it embodies an important development in how Richmond’s companies processed tobacco. During the early to mid-20th century, many transitioned from vertically designed, all-in-one buildings for housing storage and production operations, visible in the city’s Shockoe Bottom, to separate, horizontally arranged storage and production facilities, often spread out over large properties. Companies moved toward horizontal tobacco operations to keep pace with their efforts at large-scale marketing, faster production, and maintaining proprietary tobacco blends. Within Richmond, companies choosing horizontal operations looked to the less congested Manchester area on the city’s south side. The Model Tobacco Company began initial construction of its complex in Manchester in 1938. Designed by the firm of Schmidt, Garden, and Erikson, the Model Tobacco Company complex is an appealing example of the Art Deco style, with elements of the International Style, at the factory building and power plant. The last building erected at the site was a tobacco warehouse in 1952. Madison Heights School in Amherst County is a product of the Progressive Era in education, when jurisdictions consolidated smaller community schools into large, centralized institutions able to accommodate multiple grades and modern educational amenities. In this capacity the school served white students during the era of segregation, later becoming a “freedom of choice” school during desegregation. The school began around 1924-25, when the first high school building was erected on the site. Additions expanded the high school in 1930, 1934, and 1937, and in 1939 the Madison Heights Elementary School, also segregated, was built adjacent to the high school. The handsome Georgian Revival elementary school building was designed by W. Irving Dixon, a leading architect with the State Department of Education for 20 years. In 1962, the year of the school’s last graduating high school class, the 1920s-era school was demolished, leaving Dixon’s 1939 building as the architectural focal point of the complex. In 1966, local architect Charlie Lee Vail Jr. designed two additions to the elementary school that included a new kitchen and cafeteria, six classrooms and a library, all rendered in an austere Modern style that reflected the stylistic and functional evolution of school design. During its remaining years of service, the school went through two name changes until the county closed its doors in 1991. The Virginia Department of Historic Resources will forward the documentation for these 13 newly-listed VLR sites to the National Park Service for nomination to the National Register of Historic Places. Listing a property in the state or national registers is honorary and sets no restrictions on what a property owner may do with his or her property. The designation is first and foremost an invitation to learn about and experience authentic and significant places in Virginia’s history. Designating a property to the state or national registers—either individually or as a contributing building in a historic district—provides an owner the opportunity to pursue historic rehabilitation tax credit improvements to the building. Tax credit projects must comply with the Secretary of Interior’s Standards for Rehabilitation. The tax credit program is voluntary and not a requirement when owners work on their listed properties. Virginia is a national leader among states in listing historic sites and districts in the National Register of Historic Places. The state is also a national leader for the number of federal tax credit rehabilitation projects proposed and completed each year. Together the register and tax credit rehabilitation programs play significant roles in promoting Virginia’s heritage and the preservation of the Commonwealth’s historic places and in spurring economic revitalization and tourism in many towns and communities.